In the present, the epidemic of influenza H1N1 or Influenza 2009 is spreading out around the world. Now, it shows the dead from the infection this new type A (H1N1) in Thailand. The symptoms are similar to a common cold and normal influenza. Mostly, people will have very less symptoms and can recover by themselves without the need to go to hospital. However, people who die, they usually have chronic disease such as pulmonary disease, asthma, heart disease and cardiovascular disease, diabetes or who have low immunity, overweight, old people who are more than 65 years old or lower than 5 years old or pregnant women. 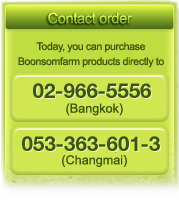 From the book of �Future Seaweed� written by Professor Dr. Somsak Vorakamin, the immunization and prevention of the growth disease by consuming spirulina is very infinite useful. In the present medical profession, almost all the antibiotics used for both human and animal, disease can have the resistance of drug reaction causing the ineffective of medicine. Many diseases that have drug resistance react start to spread out and become the main problem in public health. This is because the antibiotics is usually a kind of chemical and the disease can easily learn antibiotics while the immunization in human has become much more complicated and it is very difficult for disease to learn this from immunization in human. How can �Spirulina� build immunity and preventing the growth of diseases? Spirulina contains enzyme not less than 2000 types. The main important enzyme will cut the cycle and some types will repair the destroyed cell turning it into the normal condition. Spirulina also has complex carbohydrate which will create a chemical to stimulate the white blood cell to completely destroy microorganism and virus. Moreover, it can help to stimulate �Symmetric Cell of spinal cord bone� to produce more of white and red blood cell. This will create the immunization and preventing of disease growth.